As notebooks entered the mainstream as a conventional design for marrying a keyboard and screen, mobile pioneers worked to make computing even more personal with handheld tablet devices piloted by a stylus. GRiD had patented the notebook concept of hinging a flat panel display over the keyboard, so it earned enough money from patent licensing royalties to weather the shift toward DOS compatibility (GRiD's pioneering notebooks ran their own proprietary operating system), at least until 1988 when the company was sold off to Tandy. After that, many of the groups luminaries began to leave for other companies. That included Jeff Hawkins, who had joined GRiD in 1982 and later served as its vice president of research. Inside GRiD, Hawkins had worked with Samsung to develop a thick table-sized device called the GRiDPAD that ran DOS with a stylus on a 640x400 screen for about 3 hours before the battery died. It cost $2,370 in 1989, or about $4000 in today's currency. Hawkins saw significant potential in targeting consumers with a simpler, cheaper and more practical device, so he floated the concept of the "Zoomer" to Tandy, a project which the company wasn't interested in completing by itself. That led him to license GRiD's software and develop the product in a spinoff named Palm Computing in 1992, where he was joined by Apple alumni Donna Dubinsky. Palm produced the Zoomer with Tandy, which brought in Casio to manufacturer it. Around the same time, Go Corporation delivered the PenPoint OS as one of the first operating systems specifically designed for handheld systems. PenPoint presented an interface following the metaphor of a tabbed notebook, aiming to be simple and easy to use. Go licensed PenPoint to various companies, including GRiD. AT&T released its short-lived EO Personal Communicator running the PenPoint OS in 1993. Two wireless models were priced at $2000-$4000. The project ran out of funding and went under just a year after its launch. The demise of Go as an operating system vendor was largely attributed to the threat posed by Microsofts Windows for Pen Computing, which promised to eat up the entire market for pen based tablets and PDAs by simply adding some extra pen-savvy software to the Windows PC, enabling PC makers to deliver tablet designs without really investing in their own research and development. Windows for Pen was ultimately unsuccessful in finding an enthusiastic audience, but it did allow Go Corporation executives to later sue Microsoft for both patent violations and alleged theft of technology that GO had demonstrated to Microsoft under NDA. By the time the EO and Zoomer reached the market in 1993, Apple was finishing its own entry into the tablet market with its Newton Message Pad. That device was the result of years of work to apply Apple's core competencies in platform development and software interfaces to the mobile realm. 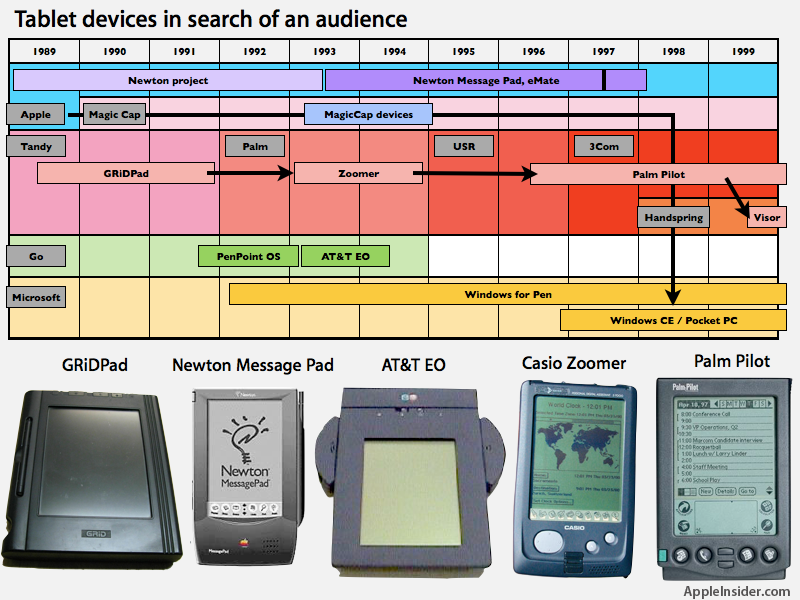 While the Zoomer was marketed to consumers, Apple's Newton platform was more broadly floated as a way to do lots of things. Unlike the broadly licensed PenPoint and Windows for Pen however, Apple planned to deliver Newton on its own as an integrated product. Beginning around the Knowledge Navigator concept in the late 80s, Apple had been working for years on how to deliver the next major computing platform, which was widely anticipated at the time to be a pen-driven tablet device. Apple invested in developing a suitable mobile processor with Acorn, creating the ARM partnership that today delivers the vast majority CPUs for mobile and embedded applications. It also worked to develop a completely unique user interface and new development tools. The company's CEO, John Sculley, debuted a Newton prototype at the Consumer Electronics Show (CES) in 1992, coining the term "personal digital assistant" to describe it. The Message Pad reached the market in late 1993 at about the same $700 price tag as the Zoomer, but with far more advanced technology that killed any prospects for Palm's Casio-built device. That reoriented Hawkins' company toward developing Newton software; Palm created the Graffiti input system to make stylus-driven handwritten recognition easier and more accurate. On the other side of the early 90s tablet spectrum, AT&T's wireless EO carried a $2000 to $4000 price tag (that's equivalent to about $2900 to $5800 today), which priced it well out of the market for most consumers. Microsoft's Windows for Pen also failed to gain any traction. Apple's Newton failed to attract buyers in the volumes that had been anticipated, leaving the company to radically dial back its investment in the new mobile platform. Parallel to Newton, a competing tablet-related project within Apple called Paradigm was spun off in 1990 to become General Magic. Unlike Apple's original strategy for Newton, General Magic intended to broadly license its operating system to a variety of hardware makers. Sony, AT&T and Motorola were partners and investors in the company, and each of them brought Magic Cap devices to market in 1994. Apple embroiled itself in lawsuits with General Magic, and by 1998 the struggling company had licensed its technology to Microsoft. The bitter series of disappointments related to tablet products and "pen computing" in the early 90s dampened interest among consumer electronics companies investigating in launching similar devices. Hawkins hadn't given up on the concept however. His third attempt at a handheld PDA was launched as the $300 Palm Pilot in conjunction with US Robotics in 1996. By that time, Apple was in deep trouble and its Newton didn't seem to have much future as an Apple-exclusive platform. The Pilot's revolutionary price point attracted lots of attention, which helped result in a resurgence of interest in tablet devices at both Apple and Microsoft. Apple's then CEO Gil Amelio, charged with the daunting task of turning the faltering company around, both acquired Steve Jobs' NeXT, Inc. and kicked off plans to license the Newton OS and spin off the mobile platform as an independent subsidiary. Following the debut of a faster new generation of Newton 2000 Message Pads and eMate devices in early 1997, Amelio launched Newton Inc., only to see Jobs effectively remove him from power and reabsorb the brand new Newton spinoff just weeks afterward. Rather than killing the Newton, Jobs said he thought the Newton platform would have a better chance at success within Apple than it would having been spun off as its own company and attempting to work with other hardware licensees. Jobs returned to the spotlight at Apple by presiding over a second product refresh of the Message Pad that was unveiled next to the new PowerMac G3 that fall. Apple had found a route out of failure, but it was still in danger. After the new Newton models failed to register any significant sales, Jobs announced that Apple would be canceling the entire project and discontinuing all future tablet development to focus on Apple's core strengths in Mac desktops and notebooks; that termination occurred in early 1998. Hawkin's Palm Pilot had helped fuel new interest in PDAs but also helped to destroy any potential for Newton's success because it effectively ate up all the low hanging fruit, leaving Apple with just the sophisticated high end, a niche market that simply couldn't sustain the development required to maintain such a complex product. At the same time, Microsoft had been working to migrate its mid-90s Windows CE "Handheld PC" concept into a device more like the Palm Pilot, initially calling its new PDA the "Palm PC" until Palm sued Microsoft to force it to come up with an original name: Pocket PC. When the Dot Com collapse occurred in 2000, the imagined market for PDA executive toys largely evaporated, leaving the rival PDA products from Palm and Microsoft contending for a much smaller market than either had planned to service. Apple was no doubt relieved that it had exited the market a couple years prior. On page 3 of 3: The rise of mobile devices.